It's not hard to see why this is a very popular model! Rated to carry four people and standard with glove box and drink holder, this model is easy to maintain as well as being loads of fun. Backed by a 15hp maximum rating it will quickly become your favourite tinnie. 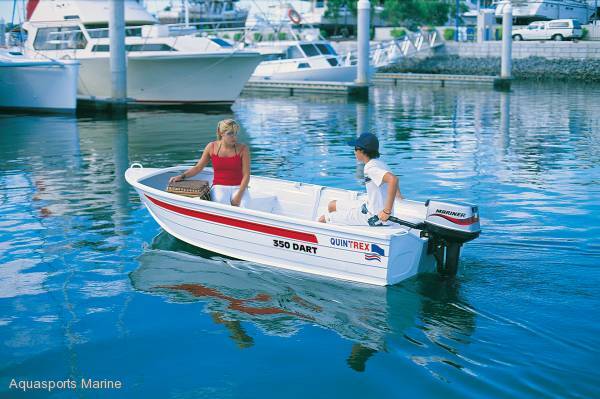 Quintrex 350 Dart Dinghy sold as Hull only or package one up with the world's most popular outboard - Mercury. We bulk purchase all of our dinghy's so we can pass on the freight savings to you. Sale now on!!! Picture for illustration purposes only and shown with optional painted hull.